TORONTO (May 12) — The headline to this blog should provide abounding impetus for readers to put money on a Pittsburgh–Anaheim clash in the 2017 Stanley Cup final. Not that my playoff picks have been a total embarrassment, mind you. I’m batting .500 after the first two rounds: 5–3 in the Conference quarterfinals; 1–3 in the semis. Yet, I’ve twice chosen against Pittsburgh and Nashville, which qualifies me for shame. As such, what is my strategy for the Conference championships? Why, of course, predicting doom yet again for the Penguins. Jim Rutherford, by now, has probably erased my cellphone number. But, my logic (yes, perhaps a misnomer) surrounds the best player and best team to this juncture of the Stanley Cup tournament. The Ottawa–Pittsburgh Eastern series features, in fact, the two best players on Earth: Erik Karlsson and Sidney Crosby. In that order… though marginally. Neither is close to 100 percent healthy. Karlsson is somehow performing at an elite level with two fractures in his foot (Novocaine has long–been a wonder drug). And, Crosby has again absorbed some frightening head trauma. Yet, both will find a way to stand out for a third consecutive series. As per usual, I’m going with the unparalleled defenseman. WERE I STARTING A TEAM TODAY, THIS MAN WOULD BE MY NO. 1 PICK AMONG SKATERS. The Senators have been the epitome of clutch in these playoffs, particularly during afternoon games — winning three matinees in overtime. Only one–such encounter — as seen, below — is scheduled for the East final: the if necessary Game 5 at PPG Paints Arena. Still, I sense that Ottawa is rather a team of destiny this spring, as it was 10 springs ago, when it played (and lost to) Anaheim in the Stanley Cup final. 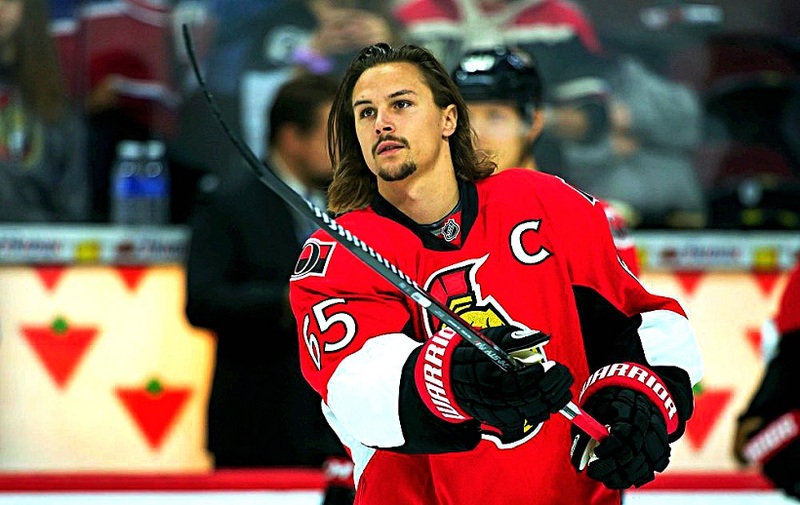 One can vaguely imagine how remarkably Karlsson would be playing right now without a pair of cracks in his foot. I’m going with OTTAWA in 6. Without question, the best team in the 2017 playoffs through two rounds is Nashville. The Predators remind me a lot of the 2012 Los Angeles Kings, who scraped into the post–season and tore a 16–4 swath through the tournament, winning their first Stanley Cup. Nashville entered the playoffs this year comfortably (by seven points) as the No. 2 wild card in the West and pulled off an astonishing sweep of No. 1–seeded Chicago in the opening round. Then came a workmanlike, six–game triumph over the hottest team at the end of the regular season: St. Louis. Now, it’s Anaheim and Conn Smythe Trophy front–runner Ryan Getzlaf. The Ducks are coming off an exhaustive, seven–game victory over Edmonton, and their big guys up front — Getzlaf, Corey Perry and Ryan Kesler — aren’t exactly kids anymore. By comparison, and with the exception of 36–year–old captain Mike Fisher, the Predators are hormonal. Yes, Pekka Rinne is 34, but goalies often save their best for advanced age (remember Dominik Hasek?). I’m taking young, plucky NASHVILLE in 6. 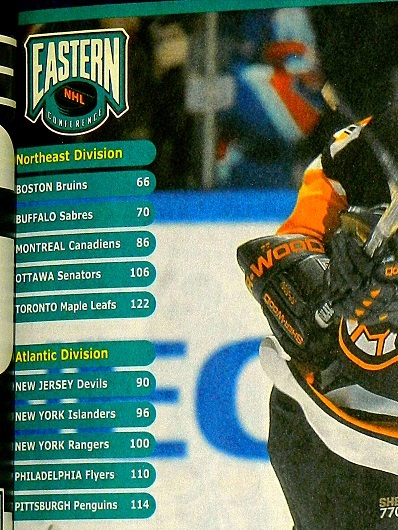 I came across the 1998–99 edition of THE HOCKEY NEWS Yearbook earlier today. 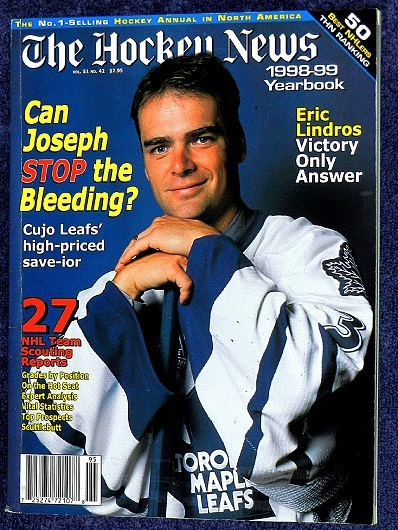 That was the season in which Curtis Joseph joined the Toronto Maple Leafs as a free agent (the best signing, to this point, in franchise history) and Pat Quinn was hired to replace Mike Murphy as head coach. 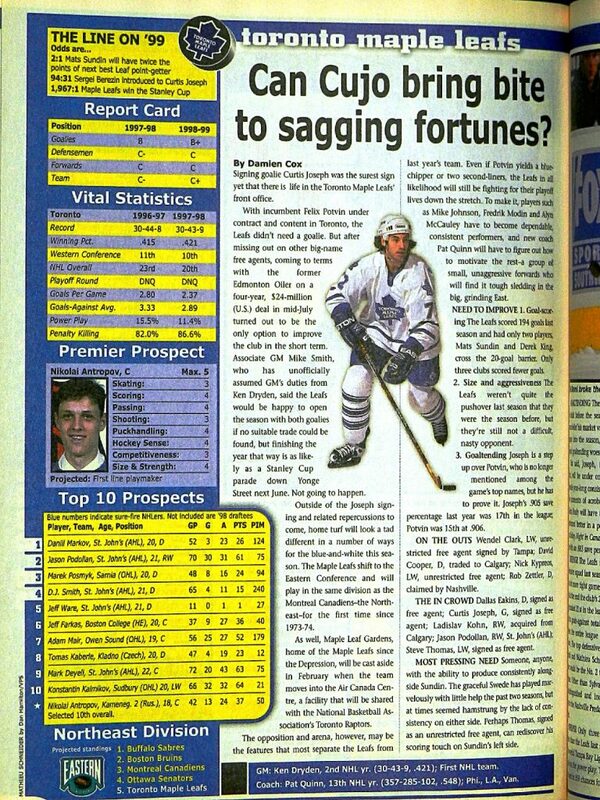 With spotty goaltending from Felix Potvin, the ’97–98 Leafs missed the playoffs for a second consecutive spring. Murphy had little choice but to clamp down with a zone–trapping system and the club scored just 194 goals, its lowest total in a minimum 80–game schedule. With Cujo providing assurance between the pipes, Quinn turned loose virtually the same cast of skaters. The ’98–99 Leafs scored 74 more goals; improved by 28 points, and made it to the Stanley Cup semifinals before bowing to Hasek and the Buffalo Sabres. Toronto, thanks to president Ken Dryden, also returned to the Eastern Conference that season. 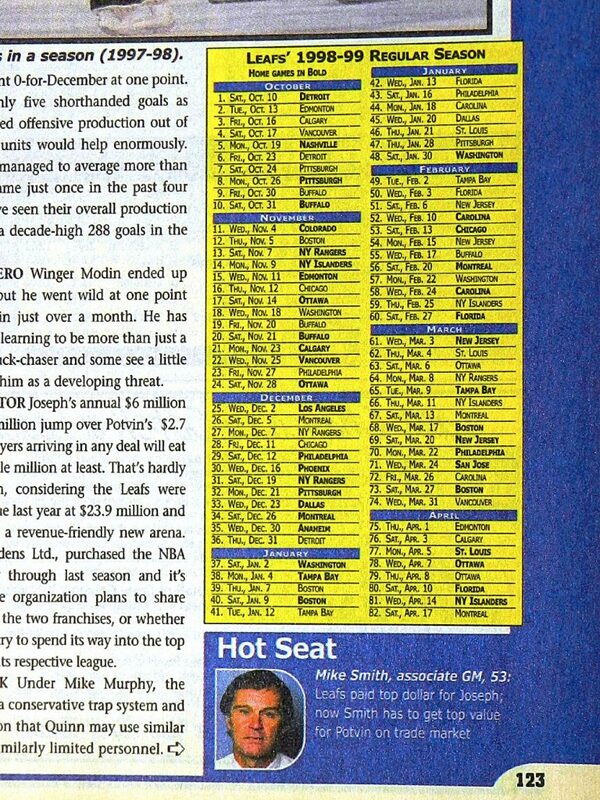 Hardly anyone foresaw such a meteoric rise from the Blue and White — thus the pre–season prediction of last place in the Northeast Division in THN’s yearbook. 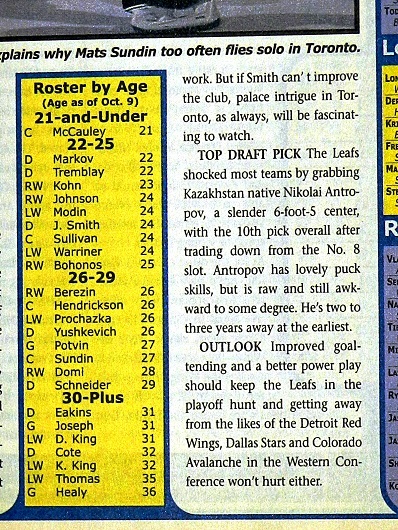 Damien Cox, then a hockey writer at the Toronto Star, penned the Leafs preview. 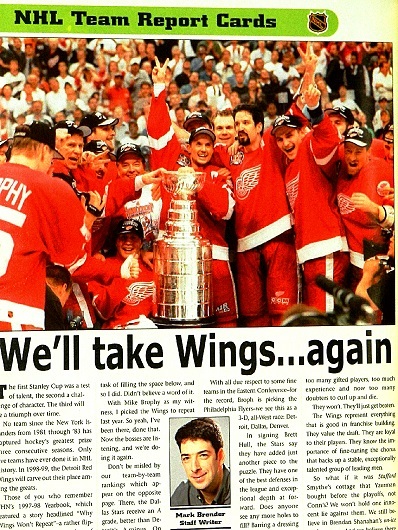 And, the editors chose Detroit to win a third consecutive championship. As it were, Toronto finished a solid second to Ottawa in the Northeast. And, Dallas defeated Buffalo in the Stanley Cup final on Brett Hull’s infamous toe–in–the–crease marker in triple–overtime of Game 6.